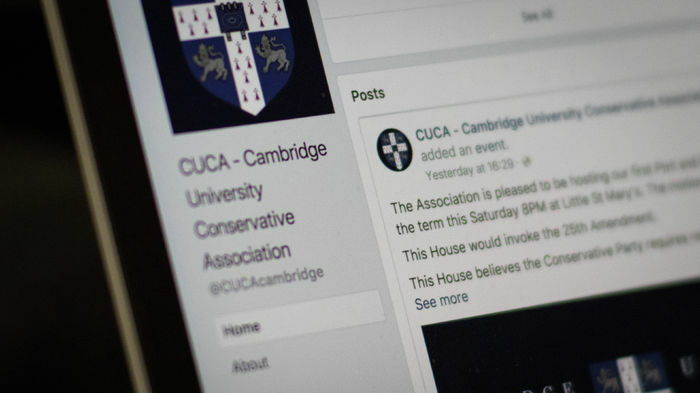 The Cambridge University Conservative Association (CUCA) is set to host former Rhodesian cabinet minister Denis Walker for its first speaker event of Easter Term, in a move which has caused controversy among some members of the Association. The event, due to be hosted on 25th April, was originally listed on Facebook as “The Rhodesian Reception - African Politics with Denis Walker”, although it has since been renamed “African Politics with Denis Walker - Rhodesian Cabinet Minister”. Although not directly related to the event, the Facebook page of CUCA’s secretary also included cover photo of him and two others wearing black tie in Westminster Hall with the caption “Rhodesian reclamation force 2017”. His page has now been deactivated. Denis Walker is a senior member of the right-wing Conservative Monday Club (known as the Monday Club), which was founded in 1961 in response to then-prime minister Harold Macmillan’s “wind of change” speech, marking the end of the British colonial era in Africa. While the Monday Club was formerly associated with the Conservative Party, the Party severed links in 2001 over its views on race, which included promoting the voluntary repatriation of ethnic minorities. The Conservative leader at the time, Iain Duncan Smith, was said to have found the group’s views “repugnant”. Walker also runs the International Monarchist League, an organisation devoted to the promotion of constitutional monarchy worldwide. Connor MacDonald, a former CUSU presidential candidate who was considered a political moderate during his time as CUCA chairman in Lent Term, called the Monday Club “a bunch of nutters and oddballs”. CUCA told Varsity that its invitation to Walker was due to “the experience he has accrued as an African politician to comment on the transformative changes occurring currently in Zimbabwean and African geopolitics”. Why make such a colossus out of Rhodes? Cecil Rhodes has become the subject of ire on University campuses in recent years. The Rhodes Must Fall campaign at the University of Oxford has seen students unsuccessfully call for the removal of a statue of Rhodes at Oriel College, arguing that the statue celebrates his imperialist legacy. Update (6:16pm, 17/04/18): This article was updated to remove the suggestion that the event would be held at Gonville & Caius College. The College have said that they do not host CUCA events, and the Facebook event now says that the location is yet to be determined.